From Bandai Shokugan. In anticipation of the new game from the Kingdom Hearts series in 2018 comes this keyblade collection! 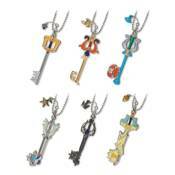 Measuring 2 3/8' tall, the die-cast keyblade charms feature a ball chain. Collect Kingdom Key, Three Wishes, Crabclaw, Oathkeeper, Oblivion, and Ultima Weapon.